Purchased this for my husband. Great price and quality. Got in a 24 in length. Very subtle and simple fashionable look. Can be worn alone or with a nice pendant. Great for an everyday effortless look. This elegant mens gold necklace features an exquisite rope chain design. Crafted of 5% 14 karat gold that is then filled with strong base metal, this necklace will be a great addition to your wardrobe. This 14k gold filled necklace secures with a lobster clasp closure providing sturdiness and durability. 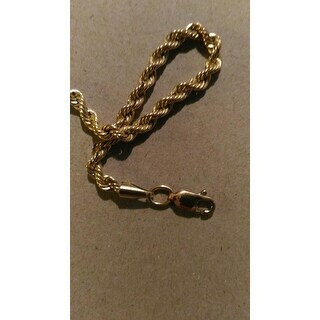 This fine gold chain is a classic as its exquisite and unique rope chain design will enhance any mans collection. This 14k gold filled necklace is 3.2 millimeters wide, making it eye-catching and perfect for everyday wear. This 14k gold filled necklace features a high polish finish that beams radiance and brilliance as it catches the light and shimmers a sophisticated elegance. 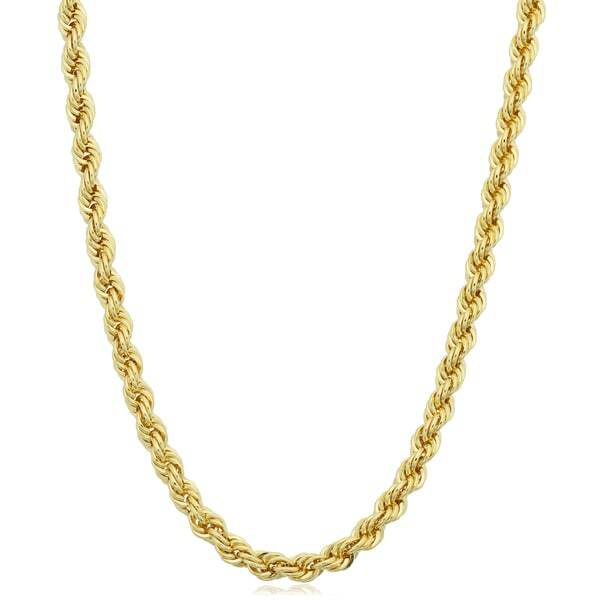 Dress up any outfit from formal to casual with this glimmering 14 karat gold filled chain necklace. This versatile chain is a wonderful choice as it can be worn on its own to make a sophisticated statement, or can be paired with your favorite chains. This gold necklace is an excellent choice for men and is offered in chain lengths 16, 18, 20, 22, 24, 26, 30, and 36 inches long. This elegant necklace holds up to everyday wear, complementing your personal style as it hangs from your neck. Gold filled means that a layer of gold has been permanently bonded to a layer of base metal, making this 14k yellow gold filled necklace as durable as it is attractive. This 14k yellow gold filled rope chain necklace is a great gift idea for yourself or a loved one for occasions such as birthday, graduation, holiday, Father's Day, Valentine's Day, or any special occasion, as this designer chain necklace is a definite must have. So I purchased this necklace about a year ago.I did my research before buying a gold filled should last a good amount of years without losing coloring or changing. So far I think the necklace looks the same EXCEPT the hook and clamp at the end of the chain they have completely changed color and are getting dark. However I do wear this necklace everyday and even shower with it. Overall it's okay. I had this a few weeks and the link started to get brown. I have not put this chain through any rigourous conditions. Was not expecting this at all. I wanted a 30 inch rope chain like the last one I had but for solid gold I knew I would have to pay about *** . This one looks great and it even has a lobster clasp. it is a very nice size in length for me. make sure you check the measurements before buying of how it will hang around your neck. it also has a nice weight to it and does not feel cheaply made. it appears very nice on my chest and for the price is an impeccable deal. I have no complaints about this, however I was not able to determine from the picture how the color was going to actually be but is sort of like a darker mustard look. in a good way though. i would definitely recommend this necklace to anyone wanting to have a decent looking gold chain around their neck without having to break the bank. 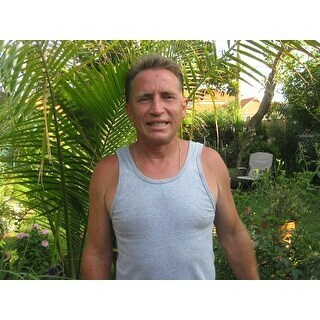 I love my Fremada Gold Chain Necklace, the highly-polished feature really shines, I'm going to order the 20 and 24 in. I highly recommend this chain the quality is excellent. This necklace looks and feels like 14K...so pleased! The price was good. When I first got this necklace, I really didn't check it out to much because it was a Christmas present. When I went to wrap it I found a kink in the chain, I sent a request for a return to Overstock and explained what was wrong and they sent me a return label , even after 30 days, like I said a Christmas present,but I never sent it back because when I was trying to get the kink out by rolling it in my fingers I broke the chain, my fault, otherwise this would be a great price for a nice gold chain, and Overstock was willing to take back. I inherited a valuable pendant that is covered with diamonds and Rubies set in a heavy gold setting. I needed a very strong Rope Chain to hang it on. This filled the bill because I never would be able to replace the pendant in a million years. Tiffany quality made by a European craftsman in the 1930s. I trusted the pendant to this chain. This is a great necklace. Purchased it for my 16 yo son for Christmas. The product was just like described. Length was to long and they made the return very easy. The necklace looks great live the weight to. Can not tell it is gold filled the clasp is also made good looks and feels like it will last a life time thanks. I love this chain. I got it for my grandson. It looks awesome on him and with great. Looks valuable. I could wear with pendant and without pendant . "Can i shower with this chain and not have to worry about it turning my neck green or the chain losing color?" I have no problem with the chain turning my neck green. It is light weight and easy to wear. Yes, you should be able to shower and not worry about it turning your neck green. "What is the base metal for this product?" "What is the weight of the 20" 14k gold filled rope chain?" "What is the weight of the 20" rope chain?" "Is the chain stamped "1/20 14kt GF" on the clasp or the end tab?" No. Only 10k, 14k, 18k real gold is stamped. This doesn't have enough gold in it to be stamped. Actually, the gold is on the metal not in it. I wanted a nice piece that I can start my jewelry collection with. I felt that due to all the positive reviews and my personal research, this piece will compliment me quite well. Can't wait to see the actual product.